Only a Manny Pacquiao could put on a memorable boxing show in front of adoring Filipino fans, give his handlers early fits and leave neither of them disappointed even if the fight didn’t end in a knockout. And although it was not the plan that American trainer Freddie Roach entirely wanted, Pacquiao showed he was in complete command against a gallant but outclassed Oscar Larios of Mexico Sunday. Pacquiao fought a relaxed, well-paced tactical fight, knocking down the Mexican twice en route to a unanimous decision win at the packed Araneta Coliseum. Fighting for the first time in his country after over two and a half years, Pacquiao found himself in trouble only in the third round when Larios surprisingly pressed the attack. 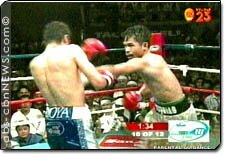 A 7-1 underdog, Larios tied Pacquiao on the ropes, landing a couple of combinations, capped by a left hook that left Pacquiao slightly dazed. But that proved to be Larios’s last hurrah. Pacquiao got himself out of trouble and ferociously counterattacked, cutting the Mexican’s left eyebrow with a right hook. "I was concerned in the third round. When it ended, I told Manny sternly that he shouldn’t go ‘sleeping’ on the ropes. You don’t fight Larios on the ropes because he also has a punch. You have to fight him in the middle of the ring," Roach said.